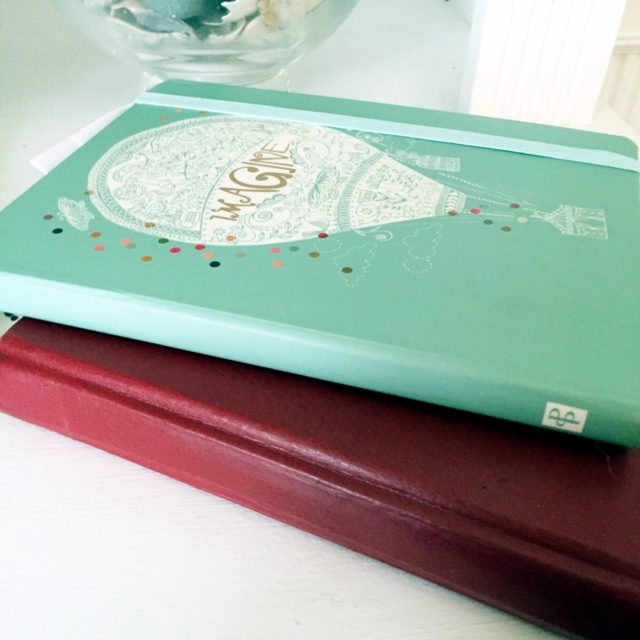 When Greg and I were first married, we bought a journal so that we could stick our family holiday cards into it each year as a way to keep track of our changes. The first card, which featured baby-faced versions of Greg, me, and my then five-year-old daughter, looked a little lonely on the white page. So as I am apt to do, I started to write a little description of our year. While I was writing about our move to our suburban apartment, our wedding, and our honeymoon, I called out to Greg and asked him to tell me what the "highlights" of his year were. Of course Brigid heard this and wanted to add some of her own highlights too. As we were talking, I asked if there was anything they'd each like to do during the year ahead. It wasn't so much a request for resolutions as it was a "wish list" or a "want to achieve" list. Over the next twelve years, we kept up the activity (so much so we had to buy another journal), and as most traditions go, we slowly added new elements until the tradition was entirely our own. We now eat Chinese food and save the fortune cookies for last, reading them one-by-one and then inserting them in the journal too. We also write down our Christmas presents and who they were each from (this comes in handy when it was time to write thank you notes). And before listing our highlights of the year past and wishes for the year ahead, we re-read our wish/want-to-achieve list from the year before. What started as somewhat of a haphazard diary entry has now evolved into a formal event. We sit together for a couple of hours, listening to each other share our memories, laughing at some of the more ridiculous moments, and for the most part, marveling at all we are capable of cramming into 365 days. But, most of all, we are always shocked at just how many of the hopes and wants that we wrote down actually came to fruition. Although there have been numerous books about doing just that--writing things down in order to make them happen, truth be told, I haven't read them. I just know their titles exist after a quick Google search. And yes, I know many self-help gurus have written long listicles about the importance of writing down one's desires to increase your odds of achieving them. But, I can only attest to what I know anecdotally--specifically what I have achieved in the past twelve years since I started this tradition with my family. And here's what I know for sure: if you want to make something happen, you need to write it down. If you want to feel happy, centered, and even proud, you need to be grateful for every experience, moment, and person in your life--and sometimes it takes writing down those experiences, moments, and people to do just that. Don't believe me. Try it. Want to achieve something? Write it Down. Over the years, other miracles/amazing coincidences of sorts have happened. I've written the words like "Write a book this year" (2009). And in that same year, I did just that. Two different times I wrote the words, "Publish a book." And those were the years Proof of Heaven and Proof Angels were acquired for publication. The funny thing about this ritual is that once we write the words down, we never look at the journal again for a year. We write our hopes down in January, put the journal back up on the shelf, and don't peek at it until January of the next year. We go about our lives. We seek experiences, not things. We live each day and sometimes muddle through--just barely. But, we nevertheless are being intentional. Somewhere deep inside us there is a compass guiding us to who we want to become, where we want to go, what we want to do. We set that compass in the beginning of the year and it points us to where we need to be whether we realize it or not at the time. Because, somehow there is power in writing down what we want, what we hope for, what we're grateful for. There is power in writing things down, because there is power in intention. When we intend to do something, we are making a conscious and concerted effort to move toward something we want. However, there is another part to all of this. There must be action following the intention. Since no action can be taken that will guarantee one might "win the lottery" or "inherit a billion dollars" it is pointless to write those types of wishes down (trust me, I've tried those too). You need to write down things that you, and you alone, can act upon. So back to intention and action: In addition to writing in the journal each year, we also write a "Mission Statement" as a family on our chalkboard in the kitchen. Unlike with the journal, we do look at the mission statement every day. This mission statement we come to collectively and vote on. Last year our mission was "Experiences, Not things." It guided everything we did. Whenever a choice came up to buy or to do, we chose "do." We traveled, saw plays, movies, went to art exhibits, hosted potluck dinners with friends, picnics, and parties. We went on long hikes and even longer drives. We said "Yes!" --a lot. Yes to a vacation in a house full of friends. (Best vacation ever!) Yes to a scholarship to a writers' conference in the Hamptons. (Time of my life!) Yes, to wedding invites in St. Louis and Cincinnati. Yes to doing things we'd never done before. (Anyone deathly afraid of heights up for a trip to the top of the St. Louis Arch? Sign me up!) Yes, to surprising my father in Connecticut for his seventieth birthday. Yes. Yes. Yes. It wasn't easy. We gave up a lot--like air conditioning. (In humid Cincinnati, that's pretty huge.) At the time I joked to my sister-in-law that our "air conditioning just took off on a plane and was headed to Charles De Gaulle." (Brigid had just flown to France and Spain for a class trip with her school.) We also went without several things all year long--and always have. We don't have two cars. I do all the shuttling, carpooling, and driving, and my husband walks and takes the bus everywhere. Instead of a car, he has experiences--talks with people on the bus and mindful walks where he can de-stress on his way from work. Me? I get a lot time to eavesdrop on my kids' conversations with their friends in the back of the minivan and find out what types of experiences they're having. My daughter doesn't have a car either and she doesn't go to an expensive private school, but she does get to travel and is learning from her experiences taking the Metro--namely how to be independent, resourceful, and on time. My son chose camps this year--robotics, stop-motion animation, farming, and theater--instead of toys and Legos. He opted for piano and violin lessons over other things, too. Me? I gave up my health, sanity, liquidity, and the annual Christmas cards in order to make all these experiences possible. (I am only half-joking.). In all seriousness, it was often stretch. It was exhausting. It was expensive. But, we applied for scholarships to make all of it possible, and somehow before we knew it the impossible was done. Sure enough: We had our year of experiences over things. When I look back over our list of all that we each did and compared it to our list of hopes for the year, I am astounded. Mainly, I am astounded I didn't drop dead from exhaustion. (I kid...not really.) This year our Hackett Family Mission is to "Choose the Good." Over the next few weeks, I'll be talking about why we're doing that (see previous comments how so many "experiences" nearly killed me), how we're doing, what we're doing, and if it's making a difference. So far--just three weeks in--I am going to be honest, it hasn't been easy. We have a lot we want to accomplish this year and a lot we want to see, do, and become--and it's going to take a lot of effort and a lot of reminding. That's why I am writing it down.